What if you could carry a full Windows computer in your pocket, one you could just plug into any HDMI port—like the one on your big-screen TV? That was the idea behind Intel’s Compute Stick. Which sucked. But a new stick PC from Asus looks like it’ll solve some of those issues. 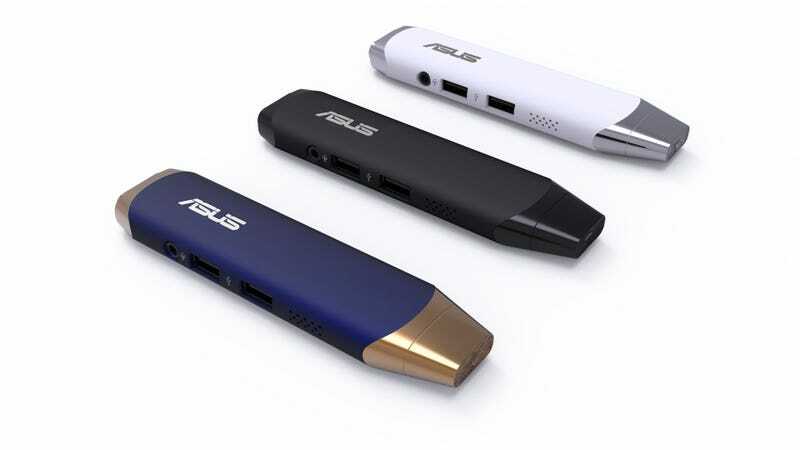 Where the $150 Intel Compute Stick had only a weak Intel Atom Bay Trail processor and a single USB port to its name, the new Asus VivoStick gets a faster Cherry Trail chip that should help alleviate some of the graphical concerns. And as you can see, it’s got two full-size USB ports—so you don’t have to go through the ridiculous trouble of swapping between a keyboard and mouse when you’re setting it up. Plus, there’s a headset jack now! This could be a perfect tiny computer for the dorm. It even costs less than the Compute Stick, at just $130. For the price, it’ll come with 2GB of RAM, 32GB of storage, 802.11b/g/n wifi, and Bluetooth 4.0. That limited storage might be a concern because there’s no longer a microSD slot. Unless you’re using one of the USB ports for an external drive or something, you can’t add more. Of course, the biggest problems with the Compute Stick were the ones we couldn’t remotely anticipate, like its terrible wifi connectivity, and its inability to provide a decent amount of power to its single USB port. Hopefully, these things will be fixed in the Asus build. Just know that there are also more powerful Core M-equipped dongle PCs on the way, if you’re willing to pay a bit more. And there’s no word on when the VivoStick will be available, anyhow. Follow the author at @starfire2258.